Coffee slimming Lipo 8 is designed for both women and men seeking to easily and naturally lose weight and bring your body in shape. 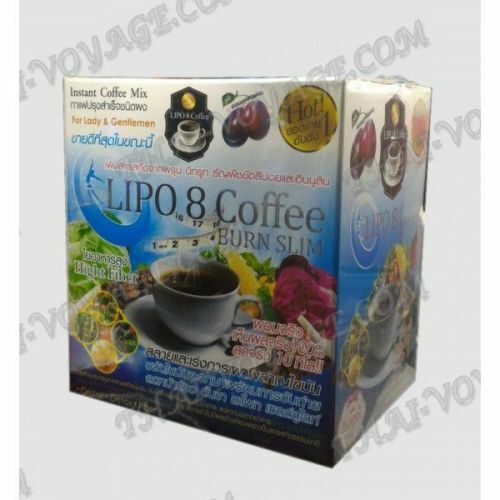 Lipo 8 as active coffee promotes weight loss by reducing appetite, removal of harmful substances from body fat burning and reduces the risk of developing diseases associated with obesity. It improves digestion, speeds up metabolism and helps to not feel hunger impedes assimilation of fats, regulates blood sugar levels and promotes normal energy metabolism. The tool contains a large number of different vitamins and minerals that contribute to effective cleaning of toxins, cholesterol and restores the normal functioning of all organs and systems. Admission coffee normalizes metabolism, blood pressure and the work of individual organs and whole body systems. The tool reduces appetite, removes harmful substances and improves overall health. As a result of drinking coffee Lipo 8 there is an effective weight loss while the overall improvement of the body and increase physical and mental activity. Application: taking coffee is recommended 30 minutes before the start of a meal. One bag of coffee pour the boiling water and drink hot. Take the drug is recommended to achieve the desired effect. Contraindications: the coffee is not recommended for pregnant women and children under the age of majority. The package contains 10 sachets per 15 grams. Composition of the product Non Dairy Cream, Coffee powder, Fiber, L-Carnitine, White Kidney Bean, Cactus and other.